Willkommen in einem sauberen, komfortablen und gemütlichen Ferienhaus am Spring Lake! Großartige Lage für Ihren Familienurlaub. Kürzlich mit neuem Teppich und frischer Farbe aktualisiert. Spring Lake Waterfront in einer privaten Umgebung am Rande des Wassers. Ein kleines Dock ist zum Angeln oder ein kleines Boot vorhanden. Das Hotel liegt am Ende einer Straße für die Privatsphäre. Zwei Schlafzimmer, 1 Bad, voll ausgestattete Küche und Veranda, damit Sie sich wie zu Hause fühlen. In der Nähe von Grand Haven und günstig in der Nähe von US 31 und I-96 gelegen. Viele Möglichkeiten für aufregende Tagesausflüge, um West Michigan zu erleben! Wir wohnen nebenan und stehen Ihnen bei Fragen gerne zur Verfügung. Wir möchten, dass Sie Ihren Besuch in den Dreistädten genießen! Great place to rest and relax. Cute little cottage. Enjoyed the owners dogs hanging out with us. So sweet. Will definitely be going back. Jill and Dave were very friendly and made us feel very welcome. A Little Gem on Spring Lake! Where to begin..... What a beautiful lake cottage! The lake is gorgeous and it's so quiet and peaceful here. We had such a wonderful time. The cottage is clean and comfy! I love the fact that it had everything we needed! My husband and I enjoyed fishing every day and the dock was big enough for my husbands fishing boat which was a huge plus! Sitting outside in the evening around the fire after grilling out was so nice and relaxing. We even got to enjoy watching 2 swans fly in and out of the cove. Jill was so nice and accommodating, it was nice to get to meet her and her dogs! I would recommend this place to anyone and we defenitly plan on coming back! The cottage was very comfortable for my husband and I for a week exploring the area. Fishing, kayaking and just sitting by the lake while at the cottage was wonderful. Grand Haven is close by and has lots to offer. Also, discovered many beautiful state and county parks nearby. Would definitely recommend this to friends and family. My wife and I love this cottage. July 2018 was our second time renting it. We stayed October 2017 with our adult son for a family birthday party. 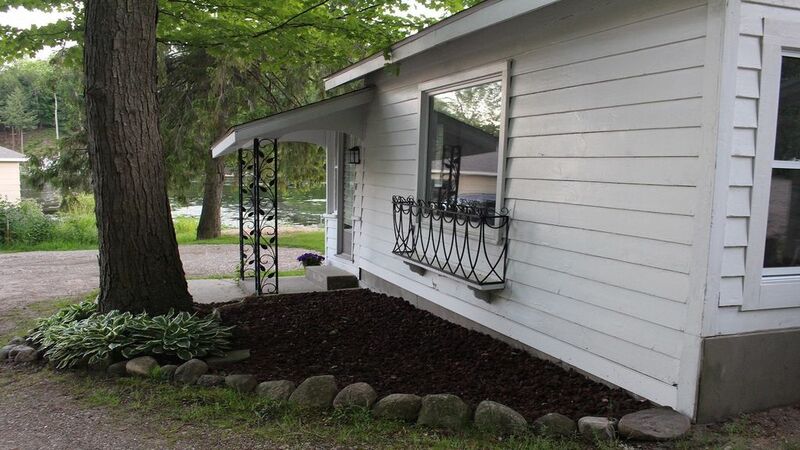 We initially chose this property due to its closeness to family, and because my wife loves to be near the water. Each visit, we found the cottage to be cozy, clean and private. The owners are next door if you need anything, which we did not on either of our visits. On our second visit, we enjoyed meeting Jill, and her daughters. The family each visit was very accommodating and respectful to us as renters. We will definitely keep this treasure as our MI go to. Thank you Jill and family for another great stay! This has been by far the best vacation we have taken since having kids. It was a low key location that we could let our kid run around without worrying about traffic etc. Jill and family were wonderful hosts (being right next door) and quickly helped us out on weird requests like an extra foot stool to reach the sink. They didn't intrude on our vacation, but were easily available as needed. They even gave us full use of their kayak. They invited us over to play with their new puppy (who we never heard barking in the night) and play in their extra beach area. It was within 10 minutes of everything in the area (down town, parks, cherry picking etc). Extra details - you'll see people fishing right out your window and they had fairly good success. There are larger boats and speed boats but they are at the far end of the lake and they're quiet even sitting on the dock. No issues sleeping! We got a lot of use from the screened in porch watching the lake and reading. We also used the gas grill and gas fire pit a lot and they both worked well. (The starters even still work!) No dish washer which we didn't mind and the AC unit is in one end of the cottage so an extra fan was used to keep both sides even temperature. Although small the cottage is very clean and comfortable. The owners live next door and are there to help with any problems or requests. Beautiful setting right on the water. So nice to meet you and glad you enjoyed you visit! Thank you for staying with us!